There is an immense amount of thrill and an overwhelming sense of achievement that you receive after caring for a patient after a serious collision, reviving a patient using CPR, or delivering a baby. The sense of achievement combined with the experience and camaraderie received from the fire and rescue service is often unreal. However, this type of work is not for everyone. Emergency Medical Technicians (EMTs) must have qualities such as integrity, dedication, assertiveness, and above all an ambition to help others in need. 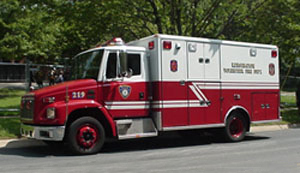 EMT.s perform work that tests their abilities in uncertain and sometimes hazardous situations. Men and women age 16 and older who are in good physical condition and have the desire to serve are eligible to become EMTs in Maryland. EMTs with the KVFD have almost never ending opportunities for training and advancement. Whether your dream is to be a Paramedic or you are looking simply to be an EMT, we have a place for you. Your advancement is only limited by your level of participation. The commitment to serve as a volunteer EMT. with the KVFD. is a life-changing decision and should not be made without serious thought. We hope you will find that you are able to make the commitment we need to contribute to the safety of the community and its citizens. You will find that participation as a volunteer EMT. with the KVFD. will be unlike any experience you have had or will ever have. Those who do not have the desire to participate in emergency activities as EMTs, or who cannot meet the physical requirements are encouraged to consider entering the service as auxiliary members.